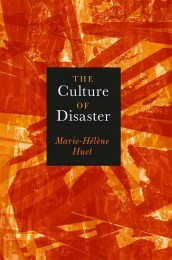 Marie-Hélène Huet, The Culture of Disaster. University of Chicago Press, 2012. 256 pp. “Our culture thinks through disasters” (2), writes Marie-Helene Huet in The Culture of Disaster. Building an argument that catastrophes have shaped the imagination of modernity, Huet’s book examines new modes of conceptualizing disaster and human power in the late 18th century and 19th centuries. In a further step, the book also argues for a direct link between post-Enlightenment discourses of disaster and present-day “states of emergency,” a move I will discuss below for its relevance to thinking about contemporary politics. Huet’s account is not about a shift from Providential to scientific and natural explanations of disaster. Instead, it is a post-Enlightenment account of changing conceptions of human responsibility and management. Although the book tracks the tendencies toward secularization that accompanied the rationalization of thought in the period, it is most usefully an account of how disaster came to be understood as political. From this perspective, disaster comes to imply the human error and misjudgment that is increasingly seen to cause it, contribute to it, or exacerbate its effects. Correspondingly, to read history of the period through the lens of disaster dramatically underscores the ordinary experience of political violence in the Revolutionary and post-Revolutionary eras in Europe and in the Americas. The “Age of Reason” was also an age of fear and unrest, and it is only logical that the discourses of catastrophe and political disorder in this period would inform each other. The first section of the book reads three key events in a new politics of “extreme disorder.” The plague outbreak in 1720 in Marseilles—the event that Foucault would use as a basis for his analysis of discipline and surveillance—was a particularly traumatic episode of the disease-to-end-all-diseases, ultimately claiming fifty thousand lives. The spread of rumors plunged the city into as much chaos as the disease itself, resulting in breakdowns in communication that threatened to destroy not only cities and families but, in the words of the writers Huet cites, all social bonds. The second example, the earthquake of 1755 that devastated the city of Lisbon, is positioned as the “first disaster of a post-theological age” (37). Although historical commentary about the earthquake demonstrates the new power of natural explanations of disaster, it also offers evidence of a new social scientific analysis—such as the idea that the number of survivors could have been greater if buildings had not been so tall and densely concentrated. (In one estimate 17 thousand out of 20 thousand houses in the city were destroyed.) Huet’s third example, the 1831-32 cholera epidemic in Europe and America, is the event most explicitly cast in political terms. Writers at the time described the disease as a “prolongation of terror” and a “state of siege” and drew explicitly on imagery of the guillotine. Moreover, in its guise as another “masked executioner,” cholera represented to some monarchical supporters the final, morbid turn of the “great equalizing” potential of the revolutionary violence of the 1790s. Chateaubriand, for instance, would describe the epidemic as having “finished what the French Revolution had begun” (75). Huet argues that commentators of the time saw both the disease outbreaks and the earthquake as humanly unknowable events that “def[ied] enlightenment”  yet demanded administrative intervention and management in precisely the ways that would later be analyzed by Foucault. What is most striking are the ways in which, before the Revolution, disaster could be seen as an excess or outbreak of the natural, whereas after the revolution disasters of all kinds, natural or political, could and would be described in mutually constitutive terms. Huet even points out how official response patterns to disease (fear of contagion—militarization—isolation) operated in parallel to responses to revolutionary sentiment. As rumor and anxiety about disease echoed the atmospheric “fever” of the mob, the effect of the cholera epidemic was to isolate France from its fearful neighbors just as political emergency had earlier done. It is tempting to treat the Lisbon quake as the most “natural” disaster of the three; yet Huet emphasizes instead the ways it challenged the limits of the natural as explanatory. She notes Deleuze’s claim that the Lisbon quake played a role for this moment in European philosophy not unlike that of the Nazi concentration camps two centuries later. The question that resounded in the wake of it—“how is it possible to maintain the least faith in a rationalism originating in God?” (Deleuze qtd in Huet 49)—was as powerful in its time as the question of how to maintain optimism in reason after Auschwitz. What made the quake a truly modern disaster in Huet’s argument is that its “natural” devastation was compounded by a new awareness of the management of risk. To replace the idea of an “act of God” with the notion of calculated “risk-taking” is of course to bring the discourse fully into the realm of social and political management. Americanist readers may draw a connection here to the discussion of seafaring and insurance in the same period in Ian Baucom’s Specters of the Atlantic, which addresses the transatlantic slave trade in terms of financial risk. The book’s second section argues that the French Revolution and the Terror contributed to a “growing sense of responsibility” in managing disasters and to the view that no catastrophe could be seen entirely apart from problems of political administration. Rousseau and Chateaubriand, writers at very different points on the political spectrum, both show how anxieties of history, freedom, and progress are shaped by political emergency. For Rousseau the nature of the compromises demanded for political freedom lead, as Huet discusses, to a combined fantasy/anxiety of the threat of individual annihilation. In contrast, the Mémoires of Chateaubriand, a monarchist supporter who lost members of his family to the guillotine reveal a different kind of “interiorization” of disaster in his accounts of visits to ancient Roman ruins; indeed the Mémoires, which describe the spectacle of antiquity through the themes of illegitimacy, usurpation, and mourning, are said to “read as the longest obituary ever written for the French monarchy” (144). For both writers the “fragmented past” of the fall of Rome hovers symbolically over eighteenth-century discourses of power and freedom. The book’s third and most compelling section focuses on catastrophes at sea. The wreck of the French ship Medusa in 1816 and the famous “lost expedition” of explorer Sir John Franklin, who set out in 1845 to discover the Northwest Passage, were two events that captured the nineteenth-century public imagination and inspired a number of contemporary artists and authors. The former served as the subject of Géricault’s famous painting The Raft of the Medusa; the latter figured in the adventure fictions of Jules Verne, whose novels of polar exploration both drew upon and sustained the Sir John Franklin legend. These chapters, which feel like the heart of the book, trace the connections between these events and the imaginative power of the mythical past: the association of Medusa with chaos and despair, and the wreck as produced by a negative cosmology of dis-astering (literally coming unfixed from navigational guidance of stars). Even the names of Franklin’s ships—Terror and Erebus (son of Chaos)—become part of an extraordinary nineteenth-century narrative overdetermination of meaning. The ultimate disaster here is associated with fragmentation of the body through cannibalism, evidence of which emerged from both events. In some of the most intricate weaving of analyses in the book, Huet connects the themes of myth, monstrosity, and dis-incorporation to the violence of the Revolution. In preparatory sketches for The Raft of the Medusa, for instance, Gericault used severed heads and limbs from the guillotine to practice depicting the cannibalized bodies of the wreck victims. His famous painting thus dramatically unites the themes of the decapitation of a mythical monster, the bodily fragmentation of cannibalism, and the legacy of political disembodiment. Huet here also develops a formal, narratological claim that disaster is that which contradicts “ordinary” narrative. Disaster is the “negation of sense and expectation” and offers fragments in place of causality, signification, and closure. But even as it thwarts and disrupts the desire to assign responsibility, disaster also provides interpretative resources. Interpretation becomes “a form of exorcism” that “also draws from the disaster its resources and its paradoxical methodology” (178). The reconstructed histories of the Franklin expedition, Huet argues, inform questions about narrative interpretation in Jules Verne’s Adventures of Captain Hatteras (1866) and Sphinx of the Ice Fields (1897). Edgar Allen Poe’s only novel, The Narrative of Arthur Gordon Pym (1838), is similarly organized around the problem of the nature of exploration and the reconstruction of narrative traces that have been fragmented in a way that is destructive yet also, for the literary imagination, ultimately productive. Can we extend this line of argument about disaster’s fragmentative and interpretive power to New Orleans, Haiti, and Fukushima? The answer for Huet is affirmative, although this is not the line the book takes. Instead it shifts to a set of twentieth-century films that, although they do not in and of themselves represent catastrophic events, are seen to incorporate a logic of disaster. Francis Ford Coppola’s The Conversation, Michael Antonini’s Blow-Up, and Ridley Scott’s Blade Runner all feature a central enigma that represents an endlessly deferred moment of full explanation or knowledge. Here Huet might be understood as reading postmodern narrative fragmentation itself as informed by the conceptual structure of disaster. In this ambitious expansion of the concept, disaster becomes a metaphor for the limits of representation in general. There seem to me two potential objections to this expansion. One is that the concept risks losing the specificity that informed the chapters dealing with disaster as an event. The second, and I think potentially more consequential one, is the risk of depoliticizing what Huet elsewhere convincingly argues must be seen in political terms. Beyond offering a figure for narrative disruption, disaster also extends postmodern antifoundationalist logic in complex and politically contradictory ways. It highlights the persistence and recurrence of “un-Enlightened” forms of thought: postsecular modes of belief, conspiracy thinking, and widespread skepticism and rejection of the authority of evidence. If the Enlightenment sought to illuminate and “disenchant” the world, its persistent dialectical counterpart is a refusal of the rationalized ordering of knowledge. Such is precisely the problem that Bruno Latour articulates in his influential essay “Why Has Critique Run Out of Steam?” pointing to the right-wing embrace of scientific uncertainty about global warming. Journalist Naomi Klein has similarly argued that the desire to preserve a particular way of life (American, consumerist, and planet-warming) logically requires the refusal of belief in scientific evidence. In this context, cultural narratives of disaster, survivalism, and planetary apocalypse can be seen as a kind of paradoxical displacement of the “anxiety of the unknown” (to borrow Huet’s term) to a more politically strategic calculation of unknowability that paralyzes human reaction. The “disorder” of catastrophe is not merely fragmentation but the impossibility of any consensus upon which to assess evidence, assign human responsibility, or manage the politics of a disaster that may be unfolding in slow time rather than as a singular, sensational event. Even where shared reason is not impossible, however, our collective anxieties about what might remain unexplainable, and how the unexplainable should shape human behavior, are certainly as political as ever. Here is where the expansion of disaster—as an “increasing sense of emergency that structures relations of power” (112)—seems most promising in explaining crises as normal states of affairs. One thinks of Klein’s “shock doctrine” thesis and the multiple contemporary forces of terrorism, neoliberal capitalism, and political instability. Huet draws a brief but suggestive parallel between the states of emergency associated with disaster and the “state of exception” theorized by Agamben. Like the suspension of juridical order that is an unexceptional exception, the logic of “emergency” is increasingly available as standard operating procedure. There is certainly more theoretical work to be done here that is beyond the purview of Huet’s book. Nonetheless The Culture of Disaster offers a compelling model of the kind of literary, cultural, and historical material that could constitute the archive for a “thick” history of disaster. Alison Shonkwiler, an assistant professor of English at Rhode Island College, specializes in American and twentieth-century literature and has also taught on the culture of survivalism. She is completing a book manuscript, The Financial Imaginary: Abstract Capitalism and the Limits of Realism.